I am back with a beginner series recipe. Watch out for more beginner series recipes from now on! Soak the puffed rice in water for 5 mins. Meantime, prepare the tempering. Add oil to a broad pan. When oil is hot, throw in mustard seeds, cumin seeds, urad & gram dals. 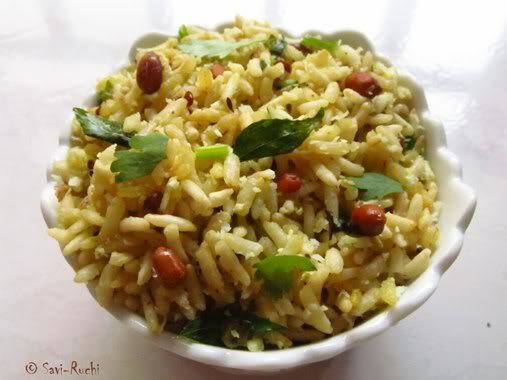 When dals turn golden, add peanuts & saute till peanuts turn golden brown. Throw in the curry leaves & green chillies, followed by onion & turmeric. Saute till the onion becomes transparent & changes color. Squeeze out the water from the puffed rice (Just draining the water isn't sufficient, try to squeeze as much water as possible). Puffed rice would have become soft by now. 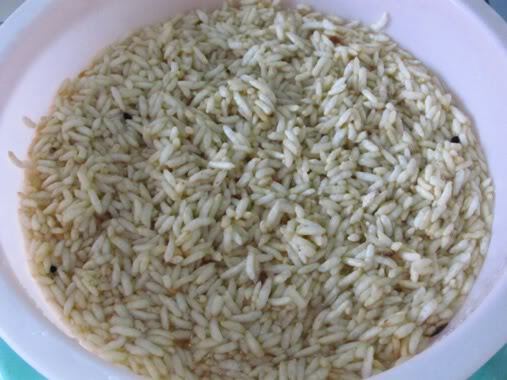 Add the puffed rice to the tempering. Mix in salt & sugar.Let it cook on a low heat for a minute or two. 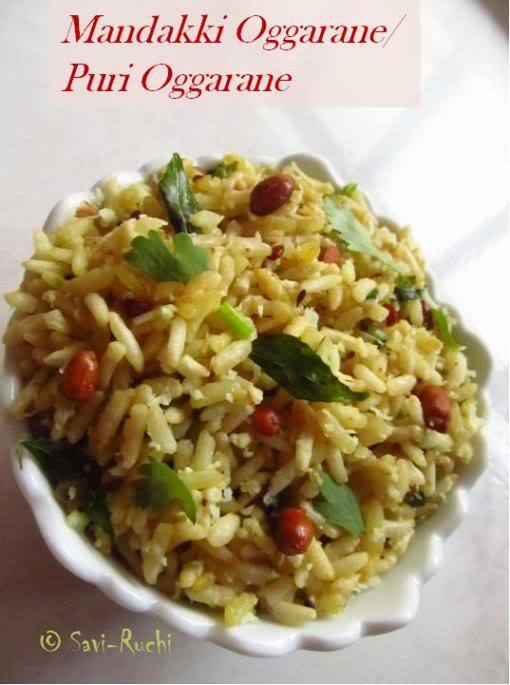 Add the roasted channa dal powder/hurigadale pudi to it & mix it well. Turn off the heat. 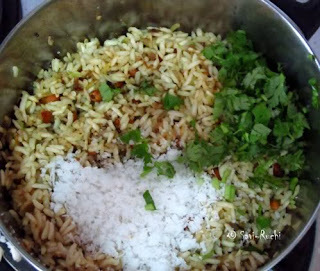 Add lemon juice, grated coconut & coriander leaves. Mix well & serve it right away! 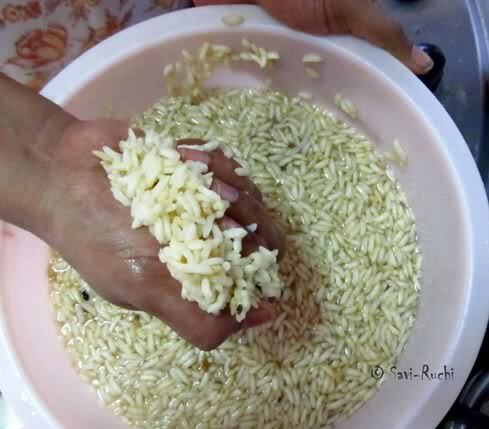 Soak the puffed rice for a maximum of 5 minutes & squeeze out the excess water from it. 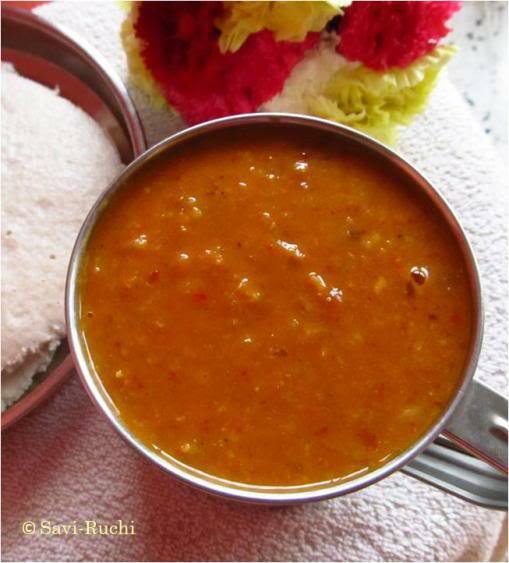 Have you tried eating idli-sambar/dosa-sambar or vada-sambar in any of the fast food joints in Bangalore? If yes, you must have gone gaga over their sambar. 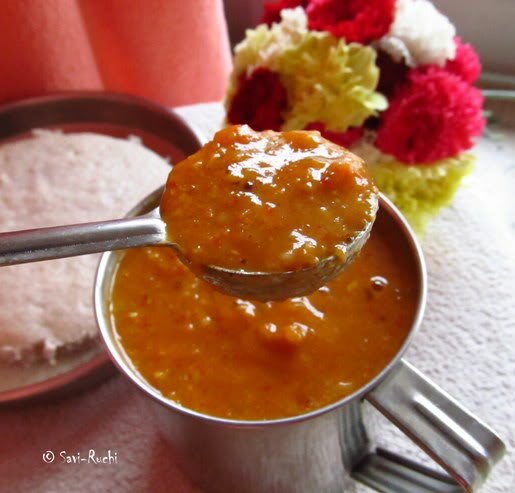 The sambar provided would be more on the sweeter side & considerably thick. I have tried to recreate their sambar over years & now I can say, I make somewhat similar to what is served in the restaurants! Ingredients: (Yields around 2 litres of sambar). Tamarind: 2 tsp, thick extract of the pulp. Wash the moong dal thoroughly. Add the finely chopped vegetables, potato & onion to the washed dal. Add water, turmeric & 1/2 tsp of salt to the vegetables. Pressure cook the dal & vegetable together for 2-3 whistles. Allow the cooker to cool. Meantime, heat a pan. Add oil & roast all the ingredients mentioned for the spice paste (except coconut & asafoetida). No need to roast each ingredient separately. 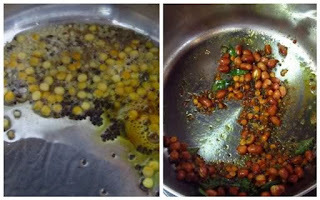 Add channa dal & urad dal first, roast it lightly. Follow it by cumin seeds, fenugreek seeds, dry red chilli. Roast it till the dry red chilli become crisp.Finally throw in curry leaves & coriander seeds. Toss for another minute. The kitchen will smell heavenly by now. Turn off the heat, add coconut & asafoetida to the roasted spices & mix well. Allow the spices to cool down. Make a fine paste of the roasted spices by adding little water. Heat a broad vessel. Add oil to it. When oil is hot, throw in mustard & cumin seeds. When seeds turn brown, add curry leaves & finely chopped tomato. Saute the tomato until it is mushy & oil separates from it. Add the cooked lentils & vegetables to it. Adjust the salt, add the tamarind extract, jaggery & the prepared spice paste. Allow it to boil for another 10-12 mins. 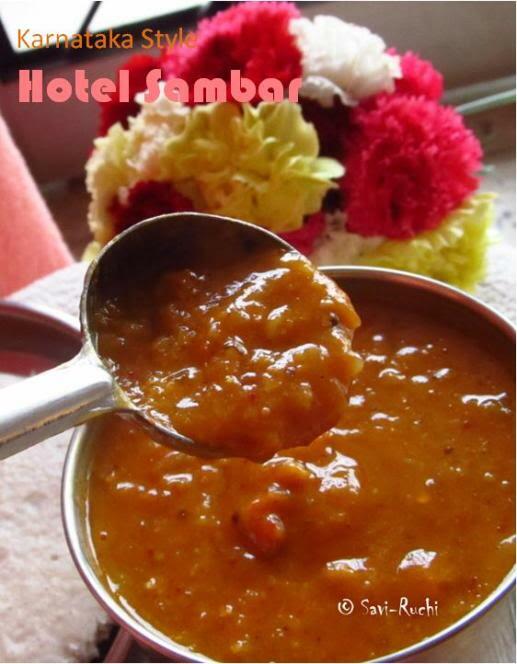 Yummy hotel sambar is ready. 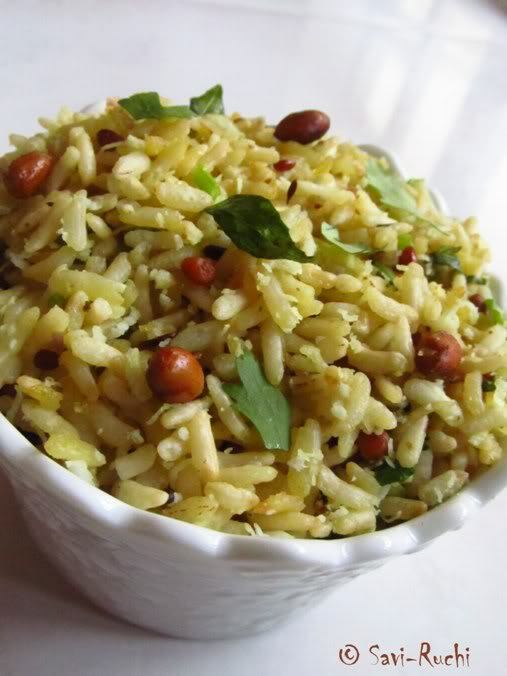 Serve it with vada, idli, dosa or even plain rice! 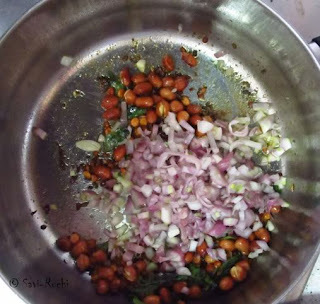 My sis's mom-in-law adds a tablespoon of roasted gram dal/roasted channa dal/hurigadale/kadala pappu while preparing the spice paste & adds only 1 or 2 tbsps of grated coconut. I have tried the sambar this way too! It taste's good. Radish greens salad: A bowl of good health! 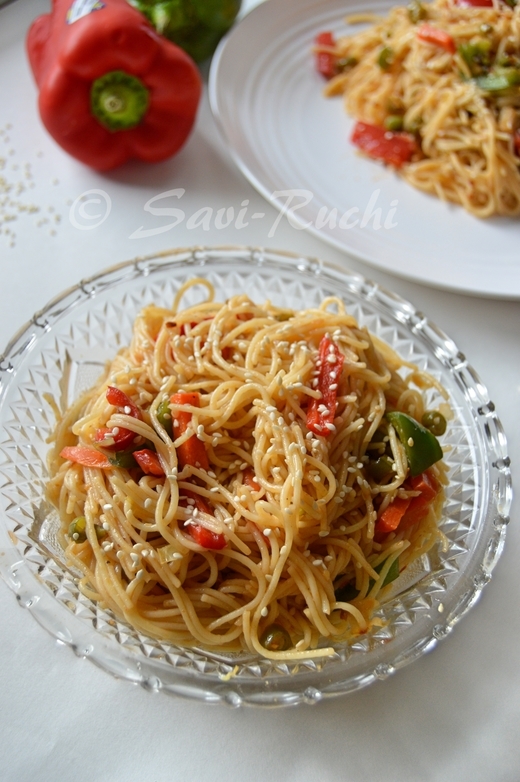 Savi-Ruchi crossed 250 recipe mark with this post & yet this is my first salad recipe!! Unbelievable but true. Now you know my family's craving for salads :( However I & my sister are an exception. We both love salads. Recently my sis joined me for lunch & we both enjoyed eating salads. I prepared this radish salad & the bowl of salad was over in less than 15mins. 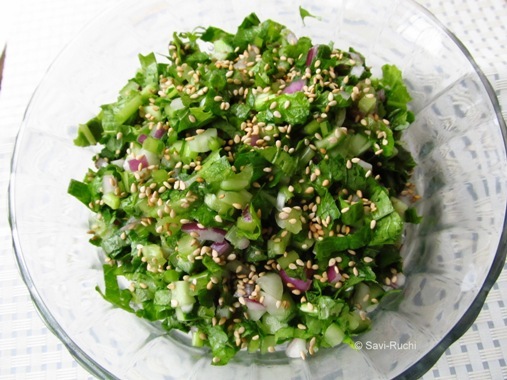 Mix together the raddish leaves, red onion & cucumber & refrigirate. 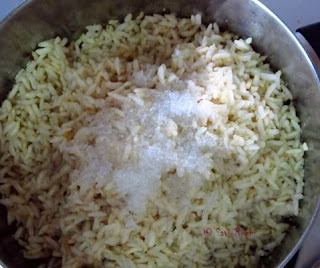 Just before serving, sprinkle the salt, pepper, olive oil, lemon juice & toss well. Garnish with roasted sesame seeds & dig in! Go ahead & add other veggies like grated carrots, grated radish or even some grated raw mango! To add crunchiness to the salad, add roasted nuts or sweet corn. There is no hard rule as to what proportion should the veggies be. Throw in whatever you like & enjoy.